I've been dreading this day since the moment I came up with my around Wales Idea. The tip of the Lleyn is a daunting challenge & deserves respect. I set of at 9AM & slowly made my way to Porth Meudwy 7NM away, hopping from headland to headland along the way. I planned to head around the tip on the young flood & had plenty of time to get there so I was in no rush. Arriving at Porth Meudwy I still had half an hour to wait before I could go. I have to admit that I was rather nervous & blowing out frequently like there was an inflatable paper bag against my lips (LOL). Once around Pen Y Cil there was some quite obvious flow, not all going in the same direction. I hit a few overfalls early on but the waves were tiny & quite playful. It was going well & I was hugging the cliffs real close as the main current was still ebbing, maybe I'm a bit too over cautious? I crossed some small bays feeling for any opposing flow & checking my speed on my GPS as I went, (still blowing out occasionally (LOL). I bumped into another kayaker, Jim, near the tip & going the other way on the last of the ebb. Strange to think I just wanted to get around the corner to the safer water & her I was chatting about kayaking. It did finally get interesting as I approached Braich Y Pwll overfall. It was quite bumpy & I was enjoying the ride till I tried to get round the point. The ebb hit me & I was being sucked back towards some standing wave that I'm sure weren't there a moment ago. I had to paddle hard, really hard to break free. The rest of the journey to the next exit, Porth Oer was thankfully uneventful. Relieved & very chuffed to be at Porth Oer again I contemplated setting up camp early but the sea was too calm to waste & the flow was now going in my direction. I treated myself to a cheese & tomato panini & a cafe latte in the cafe there, (bliss). Back underway & I decided to head for Porth Dinllaen to camp on the beach there. I encountered some bumpy water as the tide raced around the headlands but nothing to worry about. It was the last 3-4 miles that were to get a bit worrying. The wind got stronger & stronger in my face & the wind against tide conditions were getting scary. I looked at my options & decided to stay well out from the shore & use the tide to get me there quicker. Despite the strong headwind I was making 3.5 - 4 Knots & evan 5 Knots for a short while. 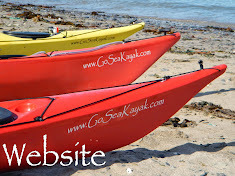 I was paddling hard & the kayak was rising on the waves & smashing down into the next ones. The last time I paddled at Porth Dinllaen it was quite calm & the overfalls at Carreg Ddu were quite bumpy evan then, I was dreading what they'd be like in these conditions. Reaching the headland at Porth Dinllaen I rested & ate a snickers in the lee of the headland preparing myself for rounding the tip. The overfalls were pretty impressive but I hugged the shore tightly & avoided the worst of them. What I hadn't counted on were the big swells steepening into waves as I approached the lifeboat station. It would of been scary but the lifeboat men were ready for a launch & were watching me. I landed right next to the station & got the camera ready to catch the launch. Fab time for the batteries to die (LOL). There was nowhere to camp near the station so I got back in my boat & made my way across to the main beach to set up camp.